The latest (and surely not final) Supreme Court ruling in Gannon v. State, known as Gannon V, is yet another pivot from their previous position outlined in this Chameleon Court’s first Gannon decision. In Gannon I in 2014, the Court posited that money was not the determining factor in determining whether the “suitable provision” clause of Article 6 of the Kansas constitution was satisfied. The justices declared that the determining factor was whether the finance system was “reasonably calculated” to meet Rose standard outcomes. As the saying goes: that was then, this is now. The Court responded to the new finance law just passed in the 2017 legislative session, SB 19, with a collective thumbs-down, finding it unconstitutional on both adequacy and equity grounds. The reason? Surprise, surprise – not enough money. The Legislature’s $290+ million increase to K-12 education over the next two years, with inflationary raises in outlying years was not enough to earn the Court’s blessing. The 88-page Gannon V syllabus reads more like a lesson in history and descriptor of school finance in Kansas than a Court opinion. 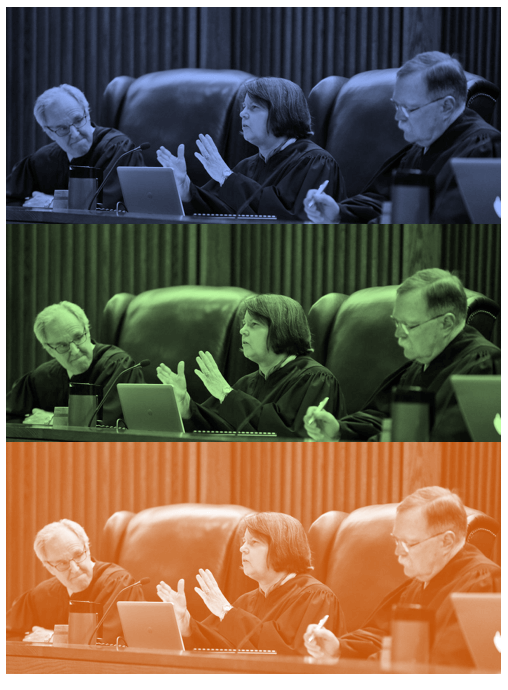 Although the justices explicitly say there is no magic number they prescribe – a departure from Montoy now over a decade ago – the Court is clearly specific in what they expect the Legislature to do, going so far as to say they should “show its work” to the Court in how they arrived at whatever the next newest finance law will look like. The Court even set date-specific milestones for the Legislature to follow: briefs on whatever the new law will be are due by April 30, 2018; oral arguments are already scheduled for May 22, 2018; and the Court will decide by June 30, 2018. There is so much in the syllabus, so much to digest, it requires significant time to provide an adequate review and analysis into Court’s latest foray on the Legislative process. Until then, here are the main takeaways from Gannon V.
Departing from what the Court said in earlier Gannon decisions, which was a departure from their logic in Montoy, the volume of money is the determining factor regarding the “suitable provision” of K-12 education in Kansas. The Court makes an erroneous causal relationship between spending and outcomes as the basis that money is the driving factor in adequacy of education. The justices completely reject the Legislature’s attempt to base the funding formula in SB 19 on a “successful schools model.” They go to great lengths to challenge the assumptions, methodology, and yes, even the number of pages in the report prepared by the Kansas Legislative Research Department that served as the basis for the Legislature’s successful schools model. Even though they’ve injected themselves into the legislative process, they show a lack of fundamental understanding of the real legislative process. The real legislative process is messy and time consuming, especially when attempting to pass a bill as significant as a new education finance law. The Court has the luxury of making their decisions in private after reviewing a handful of documents and reflecting on their notes from a two-hour oral presentation. In the case of Gannon, only three justices had to agree (justices Stegall and Beier did not participate in this case). Conversely, the Legislature has two houses, 165 members, numerous committees with hearing after hearing, AND the governor must sign whatever they pass for it to become law. Oh, yeah, then there’s the public and lobbyists and the media… With all those competing interests, the Court expects them come up with an acceptable law to the Court in a virtual finger-snap. These topics and others will be examined in much greater detail in the next installment of the never-ending story that is Kansas public education finance litigation. Stay tuned to KPI for further analysis.